The centrepiece is Watch!, a dramatic paper sculpture by Wee Viraporn. From a distance, it's a pixelated representation of Prayuth Chan-ocha's eyes, implying that the Prime Minister is monitoring Thai citizens' online activities. 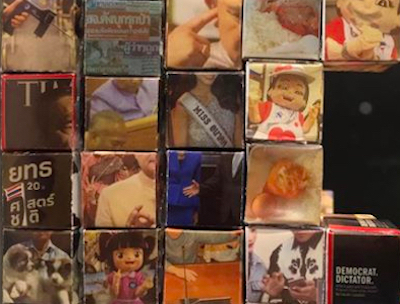 On closer inspection, each pixel is a cube featuring pictures of Thai military and junta controversies, such as the GT200 corruption scandal and the cover of Time's 2nd July issue (a Prayuth interview that the magazine's distributors withheld from Thailand). 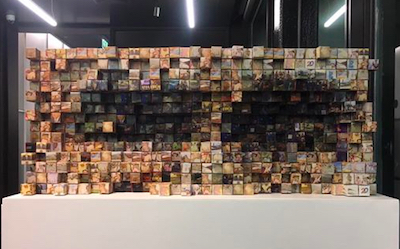 The most interesting work is much less conspicuous: a video playing on an iPhone. This short film, by Tewprai Bualoi, is a montage of online memes taken from cartoons and news clips (including extracts from Charnvit Kasetsiri's documentary 14 ตุลา), and even its title is a meme: Friendship Ended with Mudasir Now Salman Is My Best Friend (มิตรภาพสิ้นสุดกับ Mudasir ตอนนี้ Salman คือเพื่อนที่ดีที่สุดของฉัน). 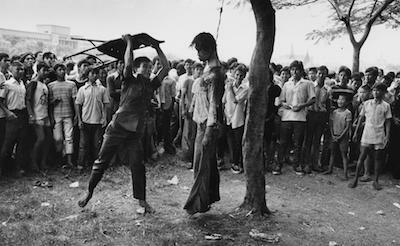 Tewprai's film uses codes and metaphors that refer to the 6th October 1976 massacre. A photo of director Nawapol Thamrongrattanarit, the Red Bull logo, and the Scout emblem refer respectively to Nawaphon, the Red Gaurs, and the Village Scouts (the three militia groups that instigated the violence). 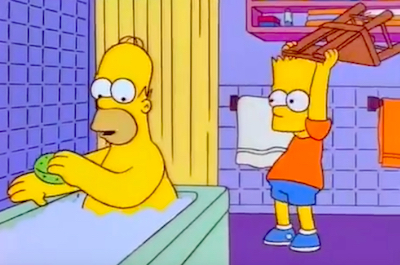 It also includes a clip from The Simpsons (broadcast on 1st December 1996) of Bart hitting Homer with a chair, in reference to Neal Ulevich's photograph of a man preparing to attack a corpse in the same way. There are also split-second shots of the gate in Nakhon Pathom from which two pro-democracy activists were hanged.